Aris is tortured by his past. The regional governor and aristocrat once traded his half-sisters’ lives for power. Seeking to redeem himself, he makes a deal with a shady agent that could get him killed. Resa is a zero-class assassin. Her predecessor was a murderous nightmare, and she has no choice but to fill those bloody shoes. She attempts to infiltrate Aris’ life to draw out the android-corrupting rogue agent. The mission reveals forbidden desires that change everything. Aris is using Resa too, but similar feelings cloud his judgment. With their passion unleashed, a secret may be revealed: the real reason the Antiata family has been sentenced to death. Resa and Aris are the only ones who can stop a human-robot war that destroys all worlds forever. 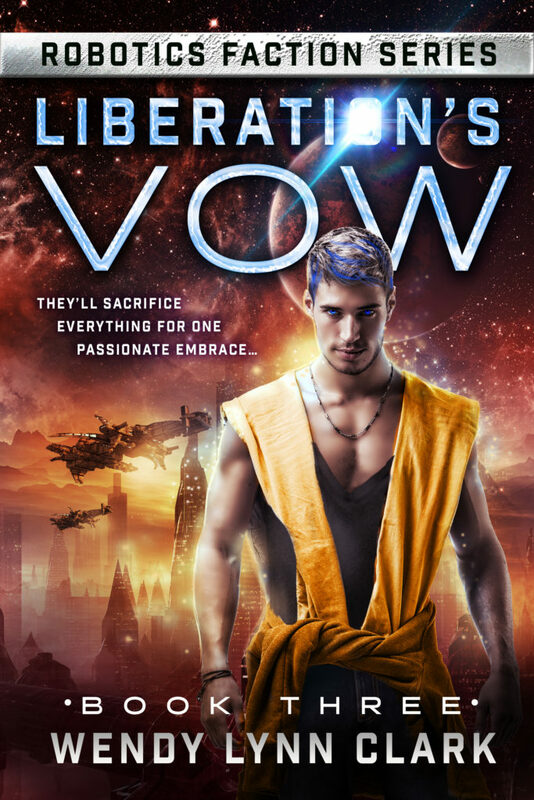 Liberation’s Vow is the third book in a series of sci-fi romances, and it can be read as a stand-alone. If you like android assassins, creative world-building, and sizzling chemistry, then you’ll love Wendy Lynn Clark’s latest roller coaster romance. Buy Liberation’s Vow to fight for love today!